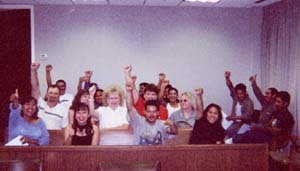 Workers belonging to the organizing committee of the Union of Needletrades, Industrial and Textile Employees (UNITE) at Angelica Textiles industrial laundry in Rockmart, Georgia, celebrate in labor court August 28. They had just won a ruling that the company must allow them and their co-workers to vote on union representation. The decision registered the workers’ determination to organize a union to fight for health-care and other benefits, as well as respect and dignity on the job and an end to abuse by the bosses. The vote is scheduled for September 26 and 27. Workers at an Angelica laundry in Chattanooga, Tennessee, are also fighting to organize a union.